OCCC’s Student Emergency Medical Sciences Association will host the last two of the four semesterly CPR classes this summer offered in a one-day format from 8:30 a.m. to 12:30 p.m. and from 1 to 5 p.m. on Friday, June 15, in Room 110 of the Health Professions Center. “It’s Basic Life Support start to finish through American Heart Association,” said Clinical Affiliation Compliance Administrator Shelly Tavis. The class is guided by upper-level students who have gone through the instructor course and are certified to teach through the American Heart Association. Throughout the four hours, a combination of didactic lecture, video and demonstrative portions are presented. The class also consists of hands-on practicing on mannequins. The class concludes with a written test and one on one with an instructor to officially check off attained skills. Upon successful completion, attendees receive a certified card that is required by the five paramedical programs, including Physical Therapist Assistant and Nursing. “Clinical agencies, hospitals, ambulance services, almost anywhere they go require that they have it,” Tavis said. 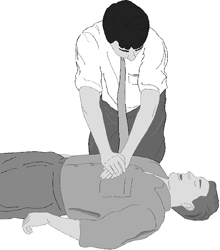 CPR training by an American Heart Association healthcare provider is a prerequisite for Basic Emergency Medical Technician. “We are a housing agent through them,” she said. Harvey Conner serves as Regional Faculty for the American Heart Association in BLS and ensures that the needed objectives are met. The class is primarily intended for and geared toward those specifically in health fields, but anyone is welcome. “We would like to see more community people because the more people that are certified, the better chances of someone’s survival rate,” Tavis said. The class consists of an estimated 1:6 instructor-to-student ratio with up to 24 attendees, so seating is limited. Registration is necessary beforehand. Cost of attendance is $25 and can be paid at the time of registration or at the door. Also necessary is a BLS Healthcare Provider textbook available in the OCCC bookstore and standard note-taking materials. To sign up and for other information, visit the Division of Health Professions located on the second floor of the Health Professions Center, or call 405-682-7507. To contact Nadia J. Enchassi, email communitywriter@occc.edu. Copyright © 2016 OCCC Pioneer. All rights reserved.